From my little corner of the world I find myself often describing the traditional music and dance world as a “little niche” market within the broader scope of Irish arts and culture. And I suppose its numbers overall may be dwarfed by theater and literature buffs, GAA followers and participants, mainstream popular music fans and even the glitzy world of competitive Irish stepdancing worldwide. But from my vantage point, all of them would be hard-pressed to match the ongoing activity of the hard-core trad music fanatics around the world made that much smaller because of travel and the Internet so that this community interacts in real time and life like never before. As I get ready to go into the bubble known as the Catskills Irish Arts Week (CIAW) where next week I mastermind a week’s worth of classes and events revolving around traditional music and dance as its artistic director, my inbox and traffic keeps me informed of many other similar occasions fostering the same goals. As the granddaddy of them all, the Willie Clancy Summer School in West Clare celebrates its 40th anniversary in Miltown Malbay, while over here Comhaltas in the Washington, D.C. area operates its own MAD-week summer school. Along with the CIAW in the same week is the Swannanoa Gathering’s Celtic Week down at the Warren Wilson College campus in Asheville, North Carolina. Following that is the Augusta Heritage Center’s Irish week now 30 years running in the mountain town of Elkins, West Virginia and then Goderich’s Celtic Festival Week in Ontario and the Milwaukee Irish Fest Summer School to tap the North American market of music students and followers. A similar series of summer schools takes place in Ireland in places like Tubbercurry in Sligo, Drumshambo in Leitrim, Achill in Mayo and Scoil Eigse in Cavan, all of which have their faithful followers from around the globe who mix their love of Irish music with cultural tourism that feeds and supports this very authentic Irish pastime while ensuring its vibrancy and future existence. And that is just the larger summer schools that have a few years under their belt. There is increasing interest in organized weekend workshops blending overseas tutors with regional and local aficionados, all of which add to that very healthy barometer reading for traditional Irish music and dance. Nobody is really tracking the numbers, and all have different make or break points or operate in different environments and contexts, but it is probably safe to assume that never have more enjoyed and raised the standard of traditional Irish music around the world than we have today. With the successful Kickstarter campaign “Rally Around the Catskills Irish Arts Week” encouraging contributions for the CIAW both online and via more direct private means, the 18th annual summer school in the Catskills is ready to take flight this weekend as that fundraising effort draws to a close on the eve of the first day of classes in East Durham. On Sunday at 7 p.m. the link at kickerstarter.com for donations closes though donations will still be gratefully accepted via the parent host organization, the Michael J. Quill Irish Cultural and Sports Centre. Then the craic begins in earnest, with 100 daily classes taught by a very distinguished and enthusiastic faculty recruited for 2012, many of them repeat-offenders (LOL). The classes require prior registration and fee payments, but many events are open to the general public including an interesting array of topics covered by the knowledgeable experts on staff. By the time week concludes 50 acts will have entertained on the Quill Festival Pavilion stages, eight ceilithe will delight the dancers who turn up to trip the light fantastic on great timber dance floors, and some 50 music sessions of all shapes and sizes where clocks and the outside world are not permitted. Once again the sleepy hamlet of East Durham will turn into the mecca for the serious fanatics who follow Irish traditional music who also enjoy meeting folks from all over North America and Ireland at this rural and rustic cultural crossroads for Irish culture. That it provides a very welcome and necessary economic lifeline to the Irish resorts, pubs and businesses in Greene County is also a well-established fact, since its heyday was neither today nor yesterday in the Catskills region that once was the recreational playground for so many Irish-born immigrants and their Irish American families and friends. Many folks will not be able to afford the luxury of escaping for the full week to the Catskills to watch all of the magic unfold, but sometimes taking in just a day or so will help you appreciate all that goes on there every year and the community spirit and buzz that take over up and down Route 145, the major artery linking events every day from Monday through Saturday. As the person charged with programming it, I try to make every day and night as good as the next so they can be viewed as a representative sample. If the weekdays aren’t possible to attend then you might consider a weekend trek up on Saturday to catch the Andy McGann Festival (noon until 7 p.m.) It is the only day when all the performing artists appear at the same place on the Quill Festival Grounds at one time or another. It is the largest gathering of traditional musicians on stage in North America and a true testament to rich legacy of traditional Irish music in New York at the festival named in honor of one of its most beloved musicians, fiddler Andy McGann, who passed away during the 2004 CIAW. If your plans will allow and you are motivated to join the hundreds of folks at this year’s CIAW, you can visit the website www.catskillsirishartsweek.org to see the daily entertainment schedules or the range of classes offered, some of which will be able to take per-diem students if the teacher and circumstances allow. Thursday night's concert will feature Joanie Madden and Cherish the Ladies and a special salute to her flute-playing mentors Mike Rafferty and Jack Coen, who went to their eternal reward in the past year but left a huge legacy of music and friendship above ground with us. Call the Quill office for more details at 518-634-2286. See you in the mountains, and look for the familiar red baseball cap touting East Durham in the Catskill Mountains if you would like to say hello. The news that no one wanted to hear arrived electronically as it often does these days last Saturday, as a large number of Irish musicians and fans in the Baltimore community were gathered to listen to their pride and joy, The Old Bay Ceili Band, play at the Creative Alliance. The concert and ceili played by a stellar group of musicians who competed at the All-Ireland Fleadh Cheoil two years ago and released a CD in the past year were actually finally celebrating its local release last weekend when word reached them of the passing of Joe Patrick Byrne, the owner of J. Patrick’s Pub. 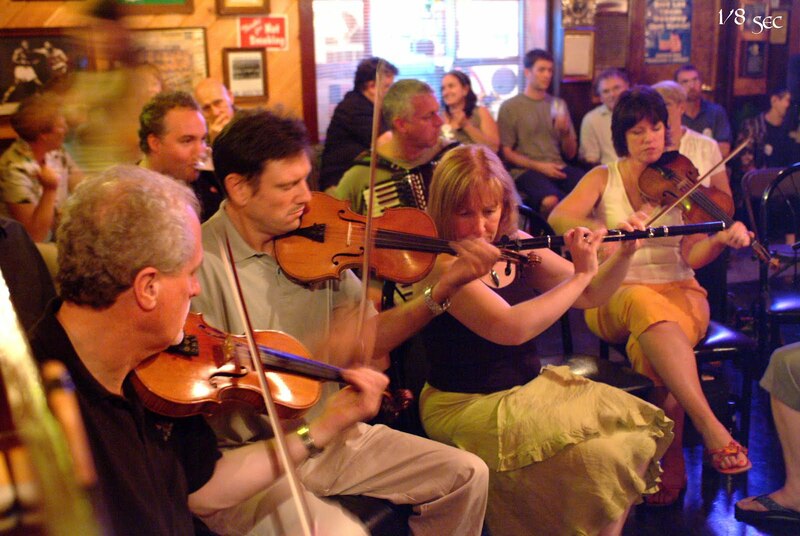 The Locust Point establishment was a veritable clubhouse for all the Irish musicians in the greater Baltimore Area and dancers flocked there also for some of the best traditional music you would hear anywhere on both sides of the Atlantic. And they owned it all to a genial native New Yorker who followed his heart when he opened up a simple neighborhood pub 25 years ago and encouraged many Irish musicians to make it their home ever since then. Byrne, 82, was predeceased by his wife Geraldine Byrne who told him to follow his dream and open an Irish pub and so he did. Following his own instincts, he knew any good Irish pub revolved around conversation and music so having televisions in his place wasn’t happening. He wasn’t just a musician’s publican, he was THE best friend that Irish music could ever have in Maryland as he welcomed it night and day. The old Navy veteran made J. Patrick’s Pub the anchor and encouraged key musicians like Billy McComiskey and Peter Fitzgerald to see it as such, and so it became the go to place for the locals and visitors alike who loved this authentic Irish pub and the man who owned it. Even Governor Martin O’Malley frequented the joint as both a musician and a patron. Fittingly after the concert last Saturday many of those in attendance went to J. Patrick’s Pub for a late session in his memory. Condolences to his children Joseph Byrne Jr., Ann, and Maureen and to his many friends in the music scene who will miss him tremendously and now must wonder what will happen to this Baltimore shrine for Irish music.